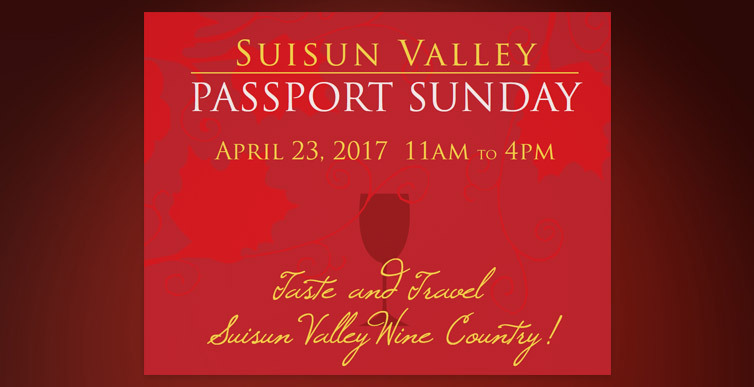 Suisun Passport Sunday is an annual event, now in its tenth year. 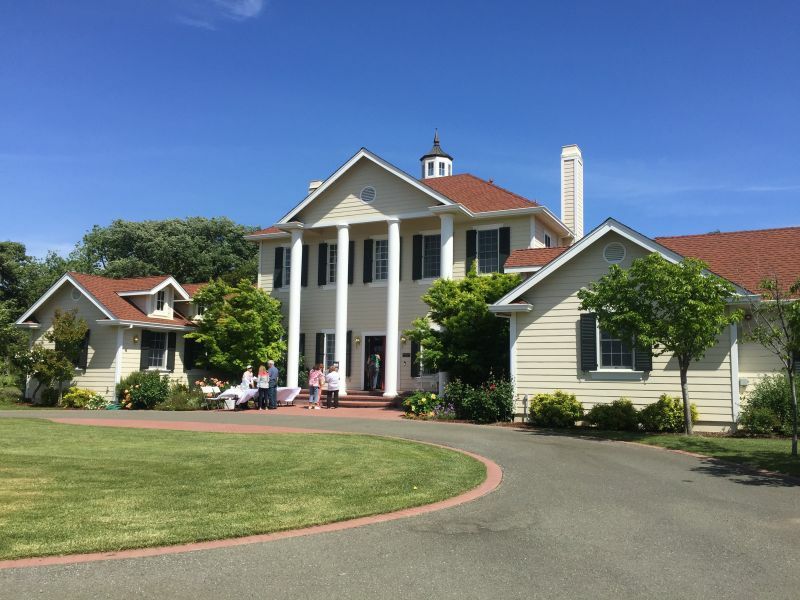 It offers an opportunity to visit wineries across Suisun Vally and Green Valley, including some that are not usually open to the public. A ticket costs $50, which allows you to taste as much wine as you like and enjoy food at each location. California Girl comments: I was in Europe so I didn’t get to attend this event. However, I did get many questionable photos from friends of The Brit enjoying himself. Who knew he was such a party animal? I have to wonder now if we are going to get strange looks from the local wineries when we next attend their functions. I am dedicated to the work of blogging, so I visited all but two of the sites on this year’s Suisun Passport. This hard slog would not have been possible without the help of a friend who acted as a designated driver. Tickets for designated drivers cost $20, which allows the holder to enjoy the food but not the wine. California Girl comments: Dedicated, uh ok, that’s what you are calling it now? We started our Sunday at Tenbrink, which is not usually open to the public. The winery sits in the grounds of the family home. I was impressed with the Tempranillo that reminded me of a young Rioja with distinct notes of vanilla swirled into dark fruits. I then tried their as yet un-named red blend. It is the first wine made by the owner’s daughter and her husband. It will be released for sale to the public later this year. Our next stop was at Seven Artisans; a winery that has picked up the weekend entertainment mantle from Winterhawk; offering live music and wine every Saturday. Admission to these events is just $10 and includes a glass of wine. I had prepared myself for the day of tasting wine by eating a hearty breakfast. 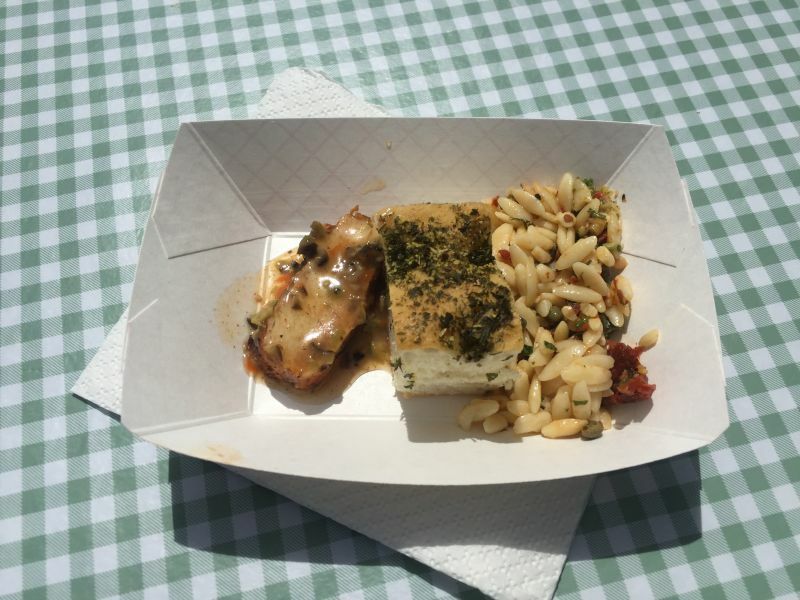 I was beginning to regret this decision, as having passed on steak and fries at Tenbrink, I also lacked the appetite to try the grilled chicken marsala on focaccia; which looked delectable and was certainly pleasing to my friends. California Girl comments: Wow, looks like I missed out on a great event! There is always next year! I enjoyed the 7 Artisans 2008 Red Côte Syrah. The wine has rich aromas of plum and a smooth mouthfeel with moderate tannins that supported cherry and raspberry. At $22, this would be a good bottle to share whilst enjoying the Saturday music. Our next stop, the first one at which I felt able to eat, was Il Fiorello Olive Oil. Before trying the food we had a sip of their sparkling wine. This was not a traditional champagne or prosecco style, but a petillant natruel. This is an older method and involves just a single fermentation. The bottle has a crown top (like a bottle of beer), rather than the traditional cork. The result is a wine with less sparkle, but an easy drinking wine with subtle fruit tastes for a hot summer’s day. This example from Onward Wines used 100% Malvasia Bianca grapes from Suisun Valley. Lunch was Sicilian lamb meatballs with arugula-faro Salad & fresh focaccia. The focaccia was clearly the official bread for Suisun Passport Sunday. 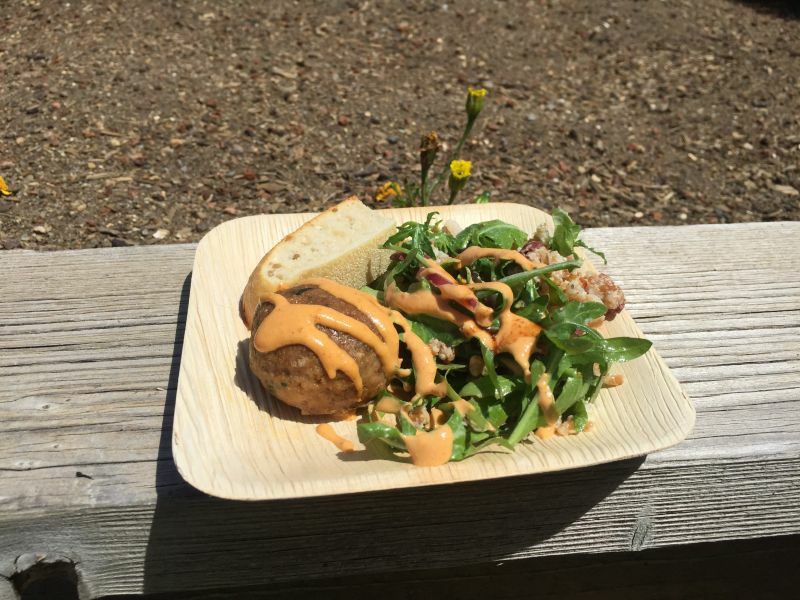 The meatball was spicy and with the addition of Il Fiorello’s excellent balsamic vinegar to the arugula, I had a tasty lunch to fill me up again and accompany a pleasant if unremarkable, red blend. Our next stop was at Mankas Corner where two of the smaller wineries in Suisun Valley were offering their wines to taste. We had been concerned that parking would be tricky at this venue. I am glad that we did not let this deter us from stopping, as both Plough and Thor wines were a delightful revelation. The Plough family have half an acre of grapes and make one hundred and fifty cases of wine a year. Their Zinfandel is from grapes grown on their property. I tried the 2014, which sells for $32. The nose was of plum and black pepper. The taste was rich jammy plum; a classic California Zinfandel. For a few minutes, the Zin was my favourite wine of the day. They also offered a Petite Sirah ($28), made with grapes sourced from Suisun Valley. A wine with robust tannins, pepper, and a blend of dark fruits. Thor family were pouring their Merlot and their blend, which is called Erik the Red. Peter Thor has five acres of Cabernet Sauvignon in Green Valley. He has been growing vines since 2011, initially selling the grapes, but now makes his own wine. I tried Erik the Red, a blend of Cabernet Sauvignon, Petite Sirah, Zinfandel, and Port. Yes, you did read that correctly. Erik the Red is a blend that has sweetness created by the addition of port. The resulting wine is intriguing; yes it is sweet, but not in a simple one-note fashion. There is complex, tasty wine, of which sweetness is just one element. We dropped by BackRoad vines, where I was persuaded to try the Sauvignon Blanc. I often find this varietal to be disappointing, especially after tasting red wine for the last few hours. However, despite the aromas of grass that all too often the precursor to an indifferent wine, here the flavours were a pleasing mix of honey and apple overlaid on a crisp refreshing sip. Wooden Valley offered a barrel tasting of their 2016 Barbera. This was only the second vintage of this wine from Wooden Valley. Unsurprisingly, tannins and vanilla were to the fore, but the notes of plum and distinct acidity held promise. California Girl and I need to try a full tasting at Wooden Valley and I am especially keen to try the bottled, older vintage. Our next stop was not a winery, but at Suisun Valley Inn. The building, which dates back to 2004, is modeled on Mount Vernon and is now available to rent as a retreat. Suisun Passport represented a chance for us to view the house and its grounds. Caymus were pouring some of their wines. 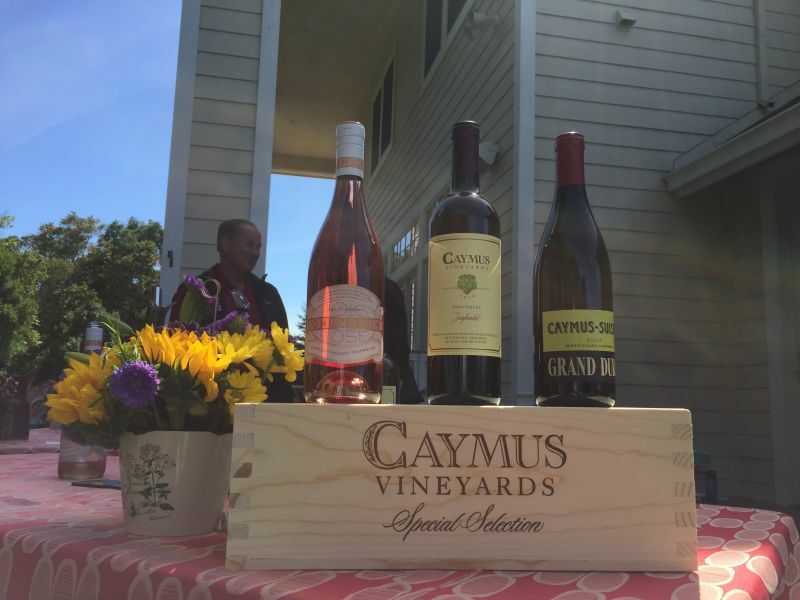 For those unfamiliar with Suisun and Green Valley wines, Caymus may be the only name you recognize. They are a famed Napa producer and have recently purchased vineyards in the area and are now making a Suisun Valley Petite Sirah. The 2014 Grand Durif had a bouquet reminiscent of a leather bookmark soaked in cassis. The wine’s flavour was rich and assertive with plum more noticeable than the tannins. California Girl comments: I’d like to interject here that by this time, one of The Brit’s companions couldn’t handle anymore by this time and went home. That didn’t stop The Brit and his charming companion Maria though. They stayed until the bitter end. Our last stop was at the recently opened Mangels Vineyards tasting room. 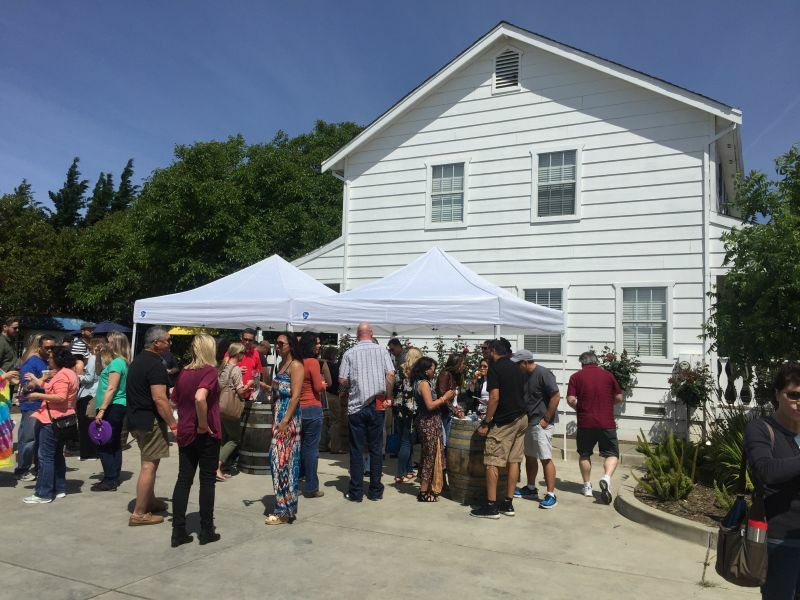 I had enjoyed their wines at the Suisun Valley Coop, at which they had poured their wines along with several other local producers. The front of the tasting room is not very impressive, but the inside and the garden at the back are far more appealing. This is another local tasting room that we need to revisit and write a complete review. Their 2012 Tempranillo was a good way to close out the day, as I had started with the Tempranillo at Tenbrink, which was made from grapes grown by Mangels. This was a noticeably different expression of the variety. It was a softer wine with a nose of vanilla and cloves. The taste had a light hint of fruit. 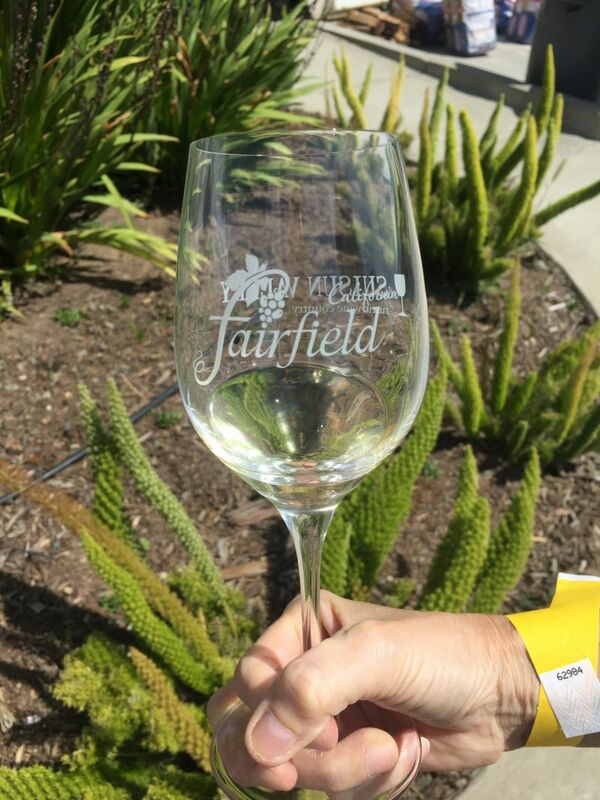 Suisun Passport Sunday is a fun event, with a wide range of wine accompanied by food. I recommend this as a chance to try wines that are different in style and price than those from nearby Napa. California Girl comments: Just remember there are more wine regions than just Napa who produce great wines. Suisun Valley is an up and coming contender.